We have hit with every USSSA, USA and fastpitch bat over the course of several weeks among several different hitters. We think the average sized 12 year old should buy the 32/22 2019 CF Zen for USSSA, the 31/21 Easton Beast X Hybrid in USA, and a drop 10 LXT Hyper in a 31 inch. These three bats received the highest marks for exit speeds, barrel profile and player feedback in the space. Bigger 12U hitters in USSSA space will like the drop 5 Easton Ghost X and the Marucci CAT 7 drop 8. The average sized 12 year old should get this bat in biggest size possible. That is, the 32/22. If they are above average weight (95lbs) or a very well above average player, then see our power hitter’s option below. Although not cheap, we think this bat’s performance and feel is remarkable. Very CF8-ish. Price check: Amazon.com. See our full review: 2019 CF Zen Review. Our bat size chart shows the best sized bat for an 12 year old, who weighs an average of 95 pounds, is 21 to 22 ounces heavy. There are more than a few ways to get a 21/22 ounce bat in the youth bat space. Remember, though, there is a difference between scale weight and swing weight. Swing weight is how difficult it is to swing a bat. (See that conversation here). As a general rule, longer bats tend to be more difficult to swing. Meaning, a 29/21 ounce bat is likely easier to swing than a 32/21. The shorter bat pushes the balance point closer to the hands and makes it easier to swing. This is not always the case, but common enough to expect it to be while purchasing. The 2 problem with 12 year olds? First, they grow, and sometimes quick. 95 pounds is the average but the range of weight might be as small as 70 pounds or as big as 125+ pounds. Follow our bat size chart and choose according to weight. Second, their skill levels often vary dramatically. Maybe more so than any other age. That means those well above average hitters will benefit from adding an ounce or two. More novice hitters will benefit from less weight. Here is where we would suggest sizing per player size and skill level at 12 years old. Adjust these numbers accordingly to the skill level of the player too. Note, as well, USA Bats do not come in as many sizes so you’ll likely need to be creative for much smaller or bigger kids than average. The CAT 7 is a monster at the plate. But we also really like a shorter drop 5 Easton Ghost X for the real big 12 year old. Depending on your budget and preference these two bats are the perfect choice for the 12U power hitter. Price check: Amazon.com. 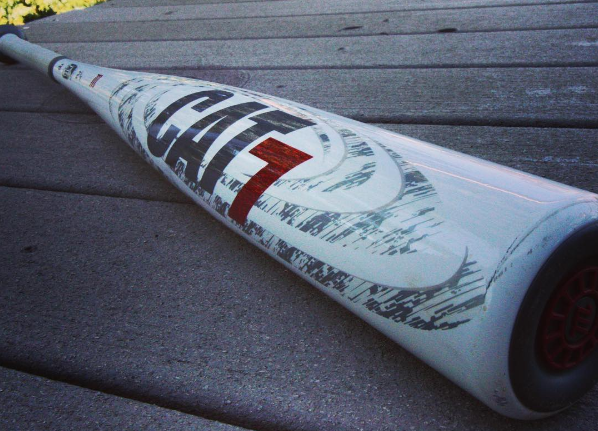 Our Full Review: Marucci CAT 7 Review. Read our full Easton Ghost X review. 12 years old is when a lot of baseball players start to take it serious. Our experience shows this is the age a lot of kids are willing to tell their parents they don’t like it enough and start specializing elsewhere. It is also the age a lot of other kids starting playing a lot of baseball. For those who are real serious about baseball, the idea of spending a lot on a bat makes good sense. We like the idea of multiplying your age by the number of games you play and spending NO MORE than that. For example, a 12 year old playing 40 games this year shouldn’t spend any more than $480 on bats. $480 could buy you any bat on any list. The 718 Select in a drop 10 or drop 8 is a great choice for the 12U USA Bat player. The two piece design and hot out of the wrapper feel are just what most players need at this age and in this category. Price check: Amazon.com. Our Full Review: 2018 USA 718 Select Review. We think every 12U player should have a wood bat in their bat. However, we do not think they should be using at the plate. Rarely will a wood bat give you the same bat dexterity, speed and performance as an aluminum or composite. But, we do like the idea for strength training and batting practice. The smaller sweet spot on a wood bat forces players to be more selective with their pitches and find the good spot of the barrel more often. If you are looking for some ideas, start with our favorite youth wood bats. Our experience with 12u baseball players is the vast majority of them prefer a composite barrel. These tend to have a bit more forgiving feel on hits and mishits. As well, the barrel profile of composites tend to be bigger and younger players prefer as much plate coverage as possible. However, do note, aluminum barrels tend to do better in cold weather as well as cost less. If you’re going to go the aluminum barrel route, we suggest you look for a two piece (often called hybrid) aluminum barreled bat. There have been no considerable changes to the premier fastpitch bat in at least a few years. And this is not a bad thing. The LXT Hyper is a brilliant bat with a great feel and a perfect balance. You can usually find decent deals on this bat especially as manufacuterers are looking to unload invenotry in time for the 2019 stock coming up shortly. Price check: Amazon.com. Our Full Review: 2017 Slugger LXT Hyper Review. 12u is a tough age to choose from for fastpitch players. Some girls here might start the year and end the year with completely different body types. But, we do like the LXT Hyper in the drop 10. If your daughter runs smaller, then consider the drop 11 in the same bat. Here in GA, and I think in most places, at 13U players are required to swing -5. So most 12U players either swing -8 to transition, or jump right to a -5. 32″ also seems long. My sone is 4’11 and 13/16 (he’s almost 5′ ok! ; ) and swings a 31″.